I finished Dracula this week. Finally. I have wasted month of reading merely to tell you: I hated it. No, it wasn’t becuase it was very slow and written in epistolary format. It wasn’t becuase the characters were lame and took over four hundred pages to capture Dracula. It wasn’t because the ending felt very anticlimactic or because I could never really understand why the mental patient was important to the plot. I hated it becuase the only poeple that Dracula attacked were women. He started out with three dancing women in his castle, who were already vampires along with him, and then he focuses on Lucy, whom he eventually also turns into a vampire. And last but certainly not least, he goes after Mina Harker. Jonathan Harker lived with Dracula for months and never got bitten. In fact, Dracula kept him locked in his room to keep him “safe” and then shipped him to an insane asylum when Jonathan came too close to stumbling on the truth. The other four men in the story, Van Helsin, Seward, Quincy, and Arthur, are never attacked, even though they are definitely vulnerable. And the crazy guy is outright killed, but never bitten. Okay, so what else am I to infer from this story but that Dracula is just after hot women? And what is this really a metaphor for?? My knowledge thus far of vampire lore has come from Twilight and Buffy the Vampire Slayer, so I can’t claim that I’m really an expert, but it was my inference from these sources that vampires will sink their teeth into any warm-blooded human they can get their lips on. Dracula proves this to be untrue. Oh, and let’s not get me started on how Stupid the men in this book are. Van Helsing is the only one with a sturdy head on his shoulders, and even he doesn’t notice that Mina is exhibitng the same symptoms of, oh, I don’t know, being bit by a vampire-ism that Lucy was right before Lucy bit the dust. At the same time the men are running about the countryside trying to find Dracula’s coffins, they say that Mina is the most awesome girl they have ever met, strong, and sensible, and no other woman would be able to handle all the horrors that this girl has heard. Because she hasn’t ever seen Dracula or anything bad, just heard about it. But then with the same breath they won’t tell Mina anything that they are doing because they don’t want to “worry her.” So she goes in to bed so that the boys can talk about vampire-y things, and then Dracula sneaks into her bedroom and bites her. Ah, irony. So, if you want to learn more about vampires, I recommend you just watch a few episodes of Buffy. It is much more entertaining and way less annoying. Plus I love Joss Whedon. A more proper title for this blog post might have been: The One Where I Find Out That I Have Feminist Tendencies, Too, Especially When Stupid Men Go Around Letting Women Get Killed. I think what you have in more modern vampire stuff is a mix of what Dracula brought to the table and the older, bloodier legends that Dracula was reacting against. 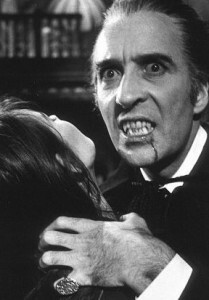 If you dig not very far behind Dracula, you find a lot of legends where vampires are ugly, bloodthirsty, and willing to hunt their own kin. Basically, that’s the evil trifecta for backwoodsy Romanion and Transcarpathian people. You get Percy Bysshe Shelley and Bram Stoker sipping cognac and laudanum one dark and stormy night and suddenly you get a much more romantically predatory version of those legends. Nowadays, you get a mash up, the best of both worlds. Seductive and beautiful but monstrous and dangerous underneath. I understand that Stoker was writing within his own worldview and that I shouldn’t really have expected better treatment of women, but the way it manifested in his story was still disturbing to me. That being said, as a rule follower, I felt temporarily terrible that we have changed the original Dracula so drastically and was compelled to say that we all had to revert back to Stoker’s flawed work. But now that you have informed me that we are merely a mash up of Stoker and previous vampire lore and have gotten “the best of both worlds” as it were, I feel much better. I can accept this. I did know that Stoker was not the inventor of vampirism, but I had assumed that his version was similar to everything before him. Thanks for enlightening me.